*Ahem: New toy alert!!! * Hello, world! As usual, it takes a bit of motivation for me to create/write anything on my blog, and this time, an iPad app and a couple of utensils did the trick. Last week, I discovered an iPad app called Procreate that allows users to sketch and paint with ease in a Photoshop-like format. It is absolutely amazing. It costs $4.99 but is worth EVERY penny. 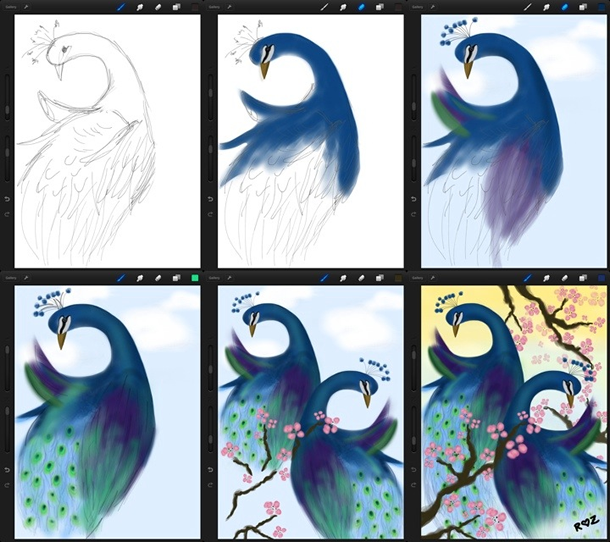 It allows you to change brush stroke/opacity/color/tip/size and you can use up to 16 layers. It supports blend modes, has up to 100 undo/redo states, a blend/smudge tool, customizable eraser and eye-dropper tool. Best of all, it exports a psd file that can be edited in Photoshop (I have yet to test this but I have high hopes!). The resolution is high definition and the zoom modes allow you to really control every detail. When I first got the app, I played around with it a bit but found it difficult to master any level of serious creativity with only my fingertips. It didn’t feel natural; I felt like I was limited to simple finger-painting at best. While I was able to get something semi-attractive going after a bit of practice, I realized that it didn’t make sense to learn how to do something with my finger that I can do so well and quickly with a pencil or brush. Then it hit me. I needed a STYLUS! 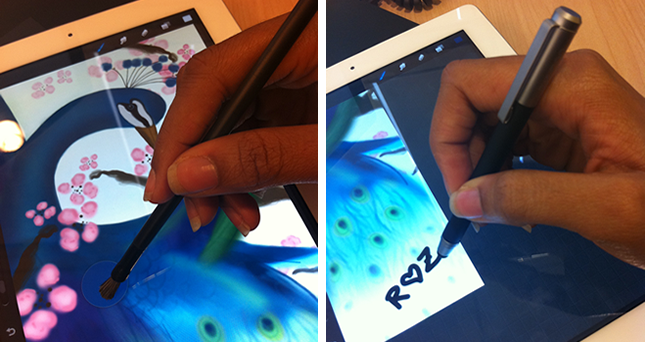 So I researched about ten different iPad styluses until I narrowed the choices down to two: the Nomad short tip brush and the Wacom Bamboo stylus. I got the Nomad brush first, and I kid you not: from the moment I put the bristles on my iPad screen and made that first stroke, I was in LOVE. Not only does the brush allow you to mimic natural brush strokes, it also lets you feel like you’re really painting on the screen. It’s incredible how well it works. $25 and also worth every penny. Last night after work, I started sketching a peacock to test the brush. Happy with its ease of use, I continued to flesh out the bird until he had a bit of personality. You can see the process below. I used different layers to create different blends and depths. By zooming in, I was able to get an amazing amount of detail on the eye and beak of the bird. After I was satisfied with his demeanor, I cloned and flipped him (another cool thing the app can do; you can duplicate and transform layers). 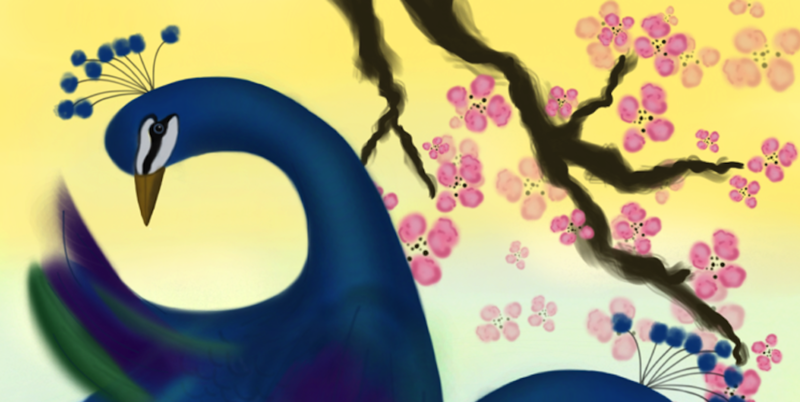 Then I gave the canvas some spice by adding some cherry blossoms and a fading yellow background for warmth. Funny thing is, when I checked my mailbox last night, my Bamboo stylus was waiting for me! I used it to write my signature. :) So far, the Bamboo is easy to use although it requires applying a bit of pressure to get it to connect to the iPad’s surface. It makes everything feel ‘pressable’ instead of ‘tappable’. It works well for general iPad tasks though, like swiping and clicking. I love it for sketching too. 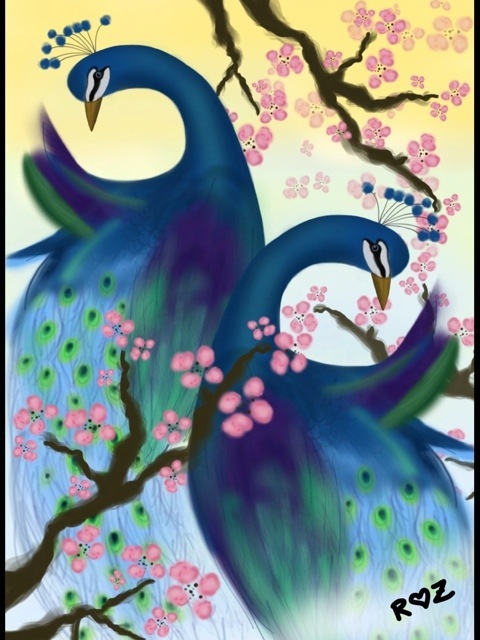 This entry was posted in Digital Art and tagged iPad, Painting, Procreate.